From frustration to determination: Three top demands! How do we fix housing in Hackney? 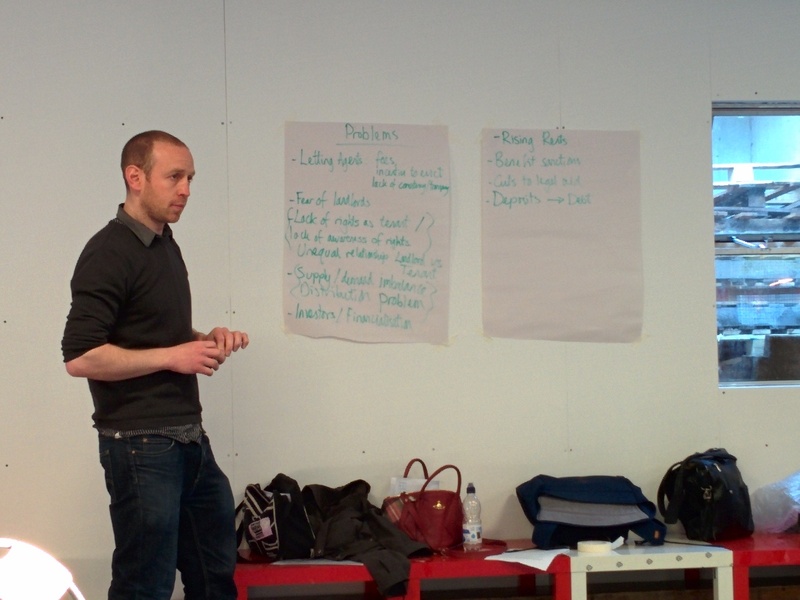 Last week Digs hosted a discussion with people in Hackney to figure out what needs to change. By the time we’d finished there was plenty to fill more than a few walls! The event was kicked off by two experienced and fiercely committed activists; Lisa MacKenzie, rebel ethnographer and LSE researcher and Heather Kennedy, founder of Digs. Both activists shared a frustration that housing policy seemed to reflect the needs of investors and markets rather than the needs of people. For MacKenzie, the cruelty of London’s housing situation seemed more inhuman than the austerity imposed on estates in the North and in the Midlands where’s she’s carried out research into community and class inequality. The main reason for this she said was one of community. While those outside London suffer from austerity, often they still have access to a strong sense of community and belonging. In London, with its rapid churn in renters and its constant evictions of social tenants, community seems to no longer factor as important in housing policy. Governments and developers in London she said have no problem tearing communities apart. We wondered if this was because you can’t easily put a price tag on the value community has in people’s lives and to society overall. MacKenzie used to make policy suggestions to politicians, but they only ever seemed interested in the suggestions that could make evictions more palatable. Now she suggests activists need to focus on speaking, not to politicians who have long ago stopped listening but to each other. Residents she said needed to work together to build power and find our own solutions to protect our homes and communities. Kennedy and other Hackney renters set up Digs in response to the injustices in private renting. She has drawn similar conclusions about going down the orthodox routes of solving the housing crisis. Meeting after meeting with policy makers, MPs and housing officials proved time and time again that the market was being placed above the needs of the people. People shared the problems they’d experienced with housing in Hackney and London; they spoke about rent increases, the sale of social housing, letting agents fees, benefit cuts, discrimination, landlord’s financial incentive to evict, a fear of landlords and an overall lack of rights for rents that prevented reporting repairs. The list went on and on. A feeling of anger and hopelessness descended with all of the problems out in the open. There seemed to be an inevitability that families would be forced out of their neighbourhoods, and London altogether, and replaced by more mobile and fiscally equipped incomers. Few renters could remember a time before landlord could double rents on a whim, ignore all health hazards and evict their tenants because of discrimination, personal disagreement or financial incentive. Increase tenants’ rights to resolve the imbalance of power between landlords and tenants, starting with the repeal of Section 21 (no fault evictions). Rent control now – not just caps on increases, but real control with decreases across London. Compulsory purchases of homes that have stood empty , which will increase sales, renting stock or council housing. End to all discrimination; social, economic, racial, class, sexuality, gender, disability, that is enforced across the board, including the end of DSS restrictions. Establish homes as for people, not for profit. Have no development that is not community led and approved. Have no evictions through developments – all tenants to be rehoused back in the community they were during and post development. These demands will now be brought to our newly elected MPs, and will constantly feed into our attempts to influence Hackney Council. But above all they are a starting point, malleable and changeable, to enter the second phase of private renters activism for Digs and our allies. They will bring together renters and communities around a common cause to fight for the right to a safe and affordable home that has been so easily ignored by policy makers. They will start a discussion that will engage renters in standing up for all their shared and individual needs. Tags: events, General election. Bookmark the permalink. I have had my home wrecked. It was done maliciously, so the tenant can go to the council and say my landlord is evicting me and give me a council house. Once someone is homeless they are a higher priority for social housing then those renting privately. I use a Section 21. Groups like Digs wrongly think all Section 21 evictions are without fault. I guess it is a convinient position to take, to smear landlords. Where is the justice? Did the Council punish my ex-tenant? Why should someone be forced to be a landlord if they don’t to be one? Given the anti-landlords propaganda. I don’t think any sensible person, wants to be tarnished with that brush. There may be good reasons the property is empty. I would never recommend anyone to rent out their own home, because there is no guarantee they will get it back in reasonable condition. The cost to put things right will outweigh any rent received. I’d certainly agree with this Tank! That was going in TOTALLY the wrong direction. Landlords discriminating against tenants should be legislated against, not legislated for. i thought of a new demand! scrap the part of the new immigration act 2014 that makes landlords check the immigration status of tenants. that can go under the discrimination one, me thinks.